For comparison, it's like Earth's axis moving from Antarctica to Australia. It’s easy to think of the Moon as a kind of dormant, predictable companion to all the hustle and bustle of life on our home planet, but a new study reveals there’s a whole lot more going on under the surface of our lunar satellite than we might assume. Scientists have discovered that the Moon wandered off its original axis more than 3 billion years ago, with the axis shifting about 6 degrees over the course of a billion years or so. That means the north and south poles of the Moon weren’t always where they are right now. “This was such a surprising discovery. We tend to think that objects in the sky have always been the way we view them, but in this case the face that is so familiar to us – the Man on the Moon – changed,” says planetary scientist Matthew Siegler from the Southern Methodist University in Dallas. Siegler and his colleagues found evidence of the lunar shift while analysing NASA records of lunar polar hydrogen. The hydrogen is contained in ice deposits hidden in craters around the Moon’s north and south poles, and the researchers detected an unusual offset of these ice deposits from the Moon’s current north and south poles. 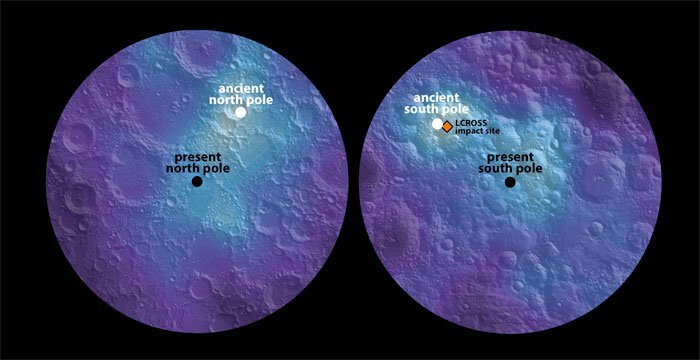 Taking a closer look at the data – gleaned from NASA’s Lunar Prospector and Lunar Reconnaissance Orbiter missions – they found the ice offset at each pole amounted to the same distance, but travelling in exactly opposite directions. In other words, the axis that runs through the Moon and around which it rotates had shifted in position, with the north and south poles adjusting to new locations on the lunar surface. While 6 degrees might not seem like a huge angle, it’s a pretty massive transformation for something as big as the Moon. But how did it happen? The answer, according to the researchers, is volcanic activity that took place under the lunar surface a long, long time before humans started gazing up at the Moon. The phenomenon, called polar wander, is thought to have occurred when ancient volcanic activity some 3.5 billion years ago melted some of the Moon’s mantle, leading it to bubble up toward the surface. This change in internal mass could have caused the whole Moon to move, slowly shifting the position and angle of its axis over a billion years, as now shown by etched ice paths on the surface. The findings, published in Nature, help us to understand more about the nature of ice on the Moon, as we now know it predates the Moon’s polar wander, indicating that it’s very ancient. This in turn could help explain how we have water here on Earth, which is something that still puzzles scientists.